Dead Souls [Three Things Thursday] – my books. my life. 2. I found this book hilarious. I remember laughing out loud when Gogol explained that the fat men rule the world. 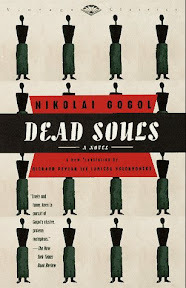 This is meant to be a critical look at Russian society and Gogol succeeded by making me laugh at it. I love me some quirky characters and Dead Souls does not disappoint in that regard. 3. I think I had a good translation and I would recommend it. I actually only read the original Part 1 of Dead Souls and, for some reason (I think I may have become a little bored and knew the rest of it was unfinished), didn’t bother reading any further, but this edition contains the entire thing. I like this feature. So many books read BB (before blogging) but my problem is I can’t ever remember the details! I started reading this last year and never finished. I think I got all the way through section 2. It was super funny though, and I can’t wait to finish it. I am glad to hear that you enjoyed it!